She washed my dishes to perfection, the object of my affection. We bought our little foreclosure house back in June. As is the case with many of foreclosures, the previous occupants stripped the home of anything that wasn’t nailed down. Gone was the oven. Gone were the washer and dryer. The refrigerator had left the scene. The only two fixtures that were left behind were the toilet (not so much as one square of toilet paper though) and the dishwasher. We went to Home Depot and ordered new appliances. The dishwasher was old and ugly, but since it worked, we kept it. A couple weeks later, I was talking to another personal finance blogger who mentioned that I should have tried to source my appliances used from craigslist. He mentioned that many folks get rid of perfectly good appliances just because they want a new kitchen. Meanwhile, their old appliances still have plenty of life in them and can be had for a fraction of the original purchase price. He told me about some of his craigslist successes. I filed the wisdom away in the back of my head and went on my way. In September, new neighbors moved in two houses down. They immediately started remodeling their home. Piles of junk appeared in front of their home as they demolished the inside. One day, I was walking past their home and there she was; a shiny stainless steel Kenmore Elite dishwasher sitting on the driveway. It was love at first site. I walked up to check her out. She was even more beautiful up close. I opened her door and the sun bounced off her beautiful stainless steel tub. She was out of my league and seemed too good to be true, but I decided to pursue her anyway. What kind of baggage did she have? Did she come from a broken home? Was she even available? I didn’t know, but vowed to find out. I went home and Googled her. Turns out, she was a couple years old, but would have sold for $800 new. Me: Nice dishwasher, what’s the story? Neighbors: Oh, we’re remodeling and decided to replace it. Me: So it’s broken then? Neighbors: Well, no. It actually works fine. Neighbors: When we moved in, the house had been vacant for a while. We opened the door of the dishwasher and it smelled a bit musty, so we decided to just replace. Upon hearing this, I tried to keep a straight face. In my head, I was doing cartwheels on a mountainside filled with flowers. Beethoven’s Ode to Joy thundered in the background. The sun was was shining. Birds sang. There was peace in the Middle East. Me (again, trying very hard to conceal my excitement): Are you selling it then? Neighbor: Sure, we were going to list it on craigslist, but haven’t got around to it yet. Me: How much do you want for it? Me: Deal. I’ll be over tomorrow with the cash. That weekend I installed my new prize. With a touch a trepidation, I fired her up and then stood back. Not only did she work perfectly, but she was the quietest dishwasher I’ve ever had. Some dishwashers can go on and on, sounding like a 747 at takeoff, never giving you peace and quiet when you’re trying to watch a football game. Not this one. She is beautiful. She is quiet. She doesn’t cost a lot. She does the dishes and she does them well. What more could a guy want? Fast forward to the present. Later this week, I’ll be picking up a used table-saw for $200 that would have sold new for $600. I recently bought a $300 ski jacket for $50. We have been scouting craigslist* for a new used kitchen table. The hunt is more fun than the purchase. I’m amazed at the stuff people sell or even give away online. A couple months back, someone was giving away all of the cabinets in their kitchen because they were remodeling, Their old cabinets looked great. I would have had the most beautiful garage cabinetry in my town. Alas, someone beat me to that, but I won’t stop looking. Next time your refrigerator goes out or the washing machine has spun it’s last, I encourage you to forget about the big box store and see what you can pick up used. There are outstanding deals to be had from silly neighbors who can’t stand the look of their 8 year old kitchen or must have a new, front loading washing machine. Don’t even think about my dishwasher though. She is staying put. *In all serious, please do be careful when buying used. I can’t stand the thought of buying stolen merchandise. If you’re buying a bike, check it’s serial number here. Check for stolen cell phones here. Ask for the original purchase receipt and serial number if applicable. If the seller isn’t forthcoming or acts strange, it is probably a better idea to skip the item. Welcome to the party!! Nothing feels better than a sick score on Craigslist, trash pile, or the thrift store. I keep my old coach’s advice and always keep my head on a swivel! Nice! The day you lose your curiosity is the day that a little part of you dies. That’s a great find. 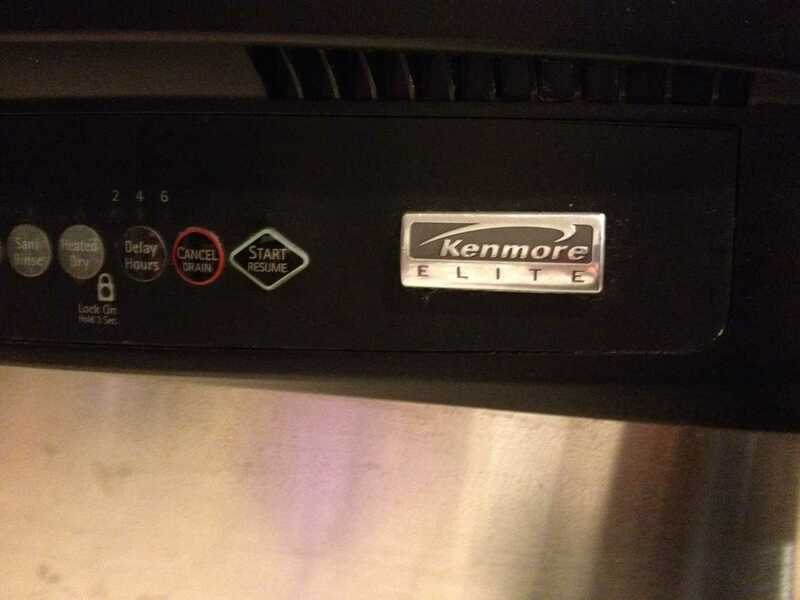 Those Kenmore Elite dishwashers rate very highly. We just had to replace our dishwasher a couple months back. The old one (from the mid-1980s) finally crapped out. To me the most amazing part is how quiet they are now. The best part of your find is you beat the scrappers to it. They would have just taken it straight to the recycler! That is good to hear! This thing seems to be built well and I’ve fixed dishwashers before, so I’m confident that I can keep this one going for a while. Great deal! I buy and sell things on CL, too (mostly kids clothes, toys, etc). But never big, major appliances like that. Hmmm, maybe next time. We recently got our *first* dishwasher after 8 years of marriage! 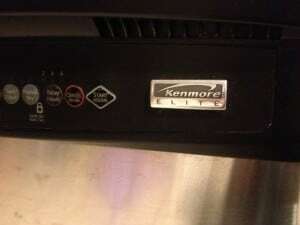 It isn’t a Kenmore elite, but it was free! I found it on freecycle when someone was remodeling their kitchen. Suddenly I have an extra hour in my day. Hooray! I’ve read that dishwashers actually use less energy and water than doing dishes by hand (as long as you don’t go through the dry cycle). An extra hour/day is a very good thing. Time is more important than anything. AWESOME find! I’m always tempted to buy used appliances because my dad can fix things up fast for me. I usually chicken out though! My dad (an electrician) would always pick stuff out of peoples’ trash to fix up. It always amazed me how simple some of the issues were. Oh look, the cord is frayed; throw the vacuum in the trash. So wasteful! That’s awesome! I just bought a Bosch brand new and don’t regret it at all, but $50… wow. Since our kitchen is also our dining room the reduced noise is a huge benefit. We can talk in normal voices in the same room as the dishwasher, which I’ve never experienced in my life before. Bosch is a great brand and it should last you a long, long time! The difference in noise between a cheap washer and an expensive one is amazing! Renee, this is a great tip! I fired up another browser tab and found a bunch of groups local to me. Thank you! This blogger wrote about it! Oh man, I’m going to have to hide this comment from the wife. Ooops, too late. She is looking over my shoulder and is already excited about it. Now, she’s looking over my shoulder reading this comment! Stay away wife! A musty dishwasher? Seriously? I’m sure running it once or twice would’ve fixed that problem! Oh well, their loss is your gain! I know! The solution is vinegar! One run through and the thing is fine. Crazy thing though is that it didn’t even smell. I suspect they were just looking for an excuse for a new toy. A couple days later, they told me that they are always broke. Ummm, let me tell you why…. Wow, what an awesome deal! It is really silly how some people just toss out fairly new things and replace them at the slightest hint something might be wrong. Oh well, better for us! My dad got a radial arm saw on Craigslist about a month ago, and apparently there was a recall or something on it. He called, and was sent a bunch of free parts. He said it’s like new. E.M. recently posted…Are Remote Car Starters Worth It? Yes, their attitudes benefit the rest of us though. Keep selling your hardly used stuff at a fraction of the cost people! Love Love Love Craigslist! I’ve bought and sold many items from there and most people are pretty nice and you can usually weed out the creeps pretty easily. I actually found my husband there which was a bit embarrassing to admit at first but we are really happy together and have been married for 2.5 years. Speaking of getting married, I bought almost all of my decorations for my wedding/reception off of Craiglist and various thrift stores. Some of it was brand new as people often change their minds. Once the “I do’s” were done, I turned around and sold most of those decorations on CL and made my money back plus a few bucks! Awesome deal on the dishwasher! Wow $50 is a great deal! We actually need a new dishwasher. Ours does still work, but eventually we know that we will need one. 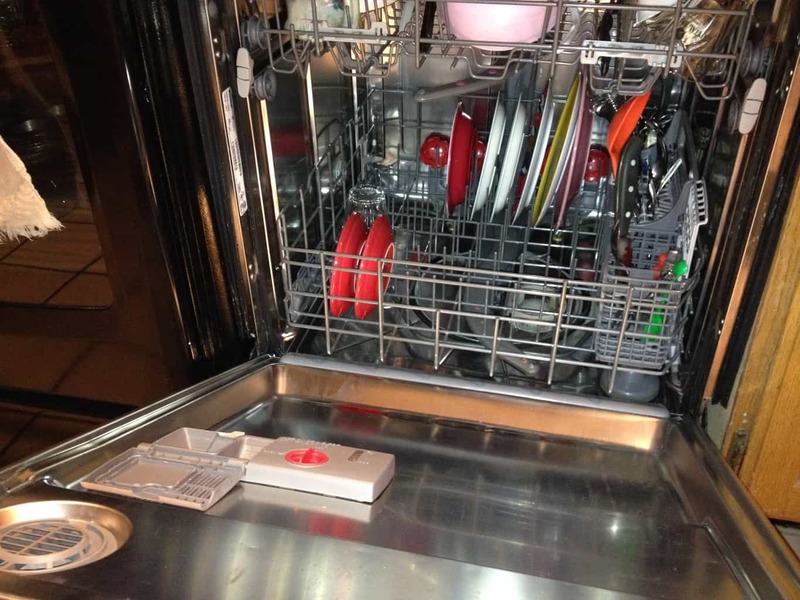 One big problem though – we didn’t realize this when we bought our house over 4 years ago, but whoever installed the flooring back then boxed the dishwasher in. So you can’t get to it until you rip out the floor or rip out the counters. I’m really hoping that the dishwasher does not break! I think that you may still be able to get it out. I’m going to send you an email shortly with a pictures and an explanation. Yes, there is a big element of trust here. I haven’t been burned yet, but plenty of others have. Usually, it’s pretty easy to feel people out. I always ask why they’re selling and if they have receipts. Nice! We scored a sink off of Craigslist recently for the garage, and I’m really excited about it. Mrs PoP @ Planting Our Pennies recently posted…We’re Vested… Now What? We have a newborn and I have always hand-washed dishes. However, I am now realizing that I would pay large amounts of money to have a dishwaser – if only to get an extra hour of sleep 🙂 Hopefully I can find as good of a deal as you did! Crap, you could have had our old one! Ugly, but worked perfectly well! These are people who are living paycheck to paycheck and they think they must come in and spend $5,000+ dollars on granite counters that have the same utility as the old ones they just replaced. It’s absolute madness! Brad! Nail. On. The. Head. I have a relative on food stamps. That didn’t stop them from purchasing a big screen TV. I can think of plenty of other people who don’t have two nickels to rub together, but somehow had front loading washing machines. Wow, $50 for a functional and quiet dishwasher is a great deal!! We’ve also had some good luck with CL, both in terms of selling and buying, and Ebay for clothes/books (I get a weird thrill when there’s bidding wars for stuff that I just had laying around the house). Awesome job! It amazes me how easy it is to sell stuff on CL sometimes. I had an ancient Honda Accord (small world, right?) and I put it on there for almost $2000. The wife thought I was nuts, but it was sold in under an hour. Score! Awesome find. Our 43 year old oven just died, and they don’t make replacement parts for her any more. So I searched and searched on craigslist for a replacement that would fit in the wall to replace the old one. Never could find one that was inexpensive and a compatible size/amperage. But with a combo of ebay coupons, buying gift cards online, and a pre-black Friday sale, we scored one for about half off retail. Just a little more than much older craigslist ovens. Wow, 43 years old. That over has seen a lot of food in it’s lifetime. Half off retail sounds like a pretty good deal, especially for a new one. Nice work. Great, now I have that song stuck in my head..
Ha, I know. That dumb song has been in my head all day. The dishwasher version though. It’s so silly how many good quality appliances the middle class wastes just because they want to renovate. Sounds like a real find! Great finish to a post with a seemingly sexist beginning. Oh man, I thought about the sexist thing too. I was just being goofy; didn’t mean to offend anyone. It’s crazy the things people will get rid of! Unfortunately in my area a combination of bad taste and low income levels means the pickings are slim. Every once in a while I luck out, though. One of my favorite finds was a wooden rocking sheep that would have sold for around $100 new. It had been left out by the road in the snow, so it had muddy slush all over it, but the “wool” was removable and washable, and now it looks as good as new. We have gotten rid of many things that we thought were pretty worthless after being heavily used, but people will snap them up from the curb. It feels good not to just throw things out. Jen @ Jen Spends recently posted…Parents: Did you know you can buy your girls toys that aren’t pink? Oh wow, the rocking sheep is awesome! I’m glad you rescued him! These are the moments that life is made of: sick Craigslist scores!! If I had more time, I would totally look for ads like this and make some extra money reselling them but I have enough to do with my blog. I wish I could win the dishwasher lottery. We have an apartment-sized one in our rental unit that I think is on its last legs. Alicia @ Financial Diffraction recently posted…change your procrastinating habit. I hate to tell you this but i have that dishwasher and the buttons are failing. I of course didn’t pay $50 for mine and to have it do this after owning it for 3 years is a joke. Yeah, that is just wrong. So far, the thing has been great to us.